Overview of the Greenhouse Effect. Global Change Syndrome, General Outlook (H.W. Scharpenseel and P. Becker-Heineman). 2. Inputs to Climatic Change by Soil and Agriculture Related Activities. Present Status and Possible Future Trends (A.F. Bouwman and W.G. Sombroek). 3. Processes that Affect Soil Morphology (R.W. Arnold). 4. Influence of Climatic Change on Soil Moisture Regime, Texture, Structure and Erosion (G.Y. Varallyay). 5. Resilience Against Climate Change? Soil Minerals, Transformations and Surface Properties, Eh, Ph (R. Brinkman). 6. Impact of Climatic Change on Soil Attributes. Influence on Salinization and Alkalinization (I. Szabolcs). 7. Soil Organic Matter and Biology in Relation to Climate Change (P.B. Tinker and P. Ineson). 8. Influence of Climatic Change on Development of Problem Soils Especially in the Alluvial Domains (W.R. Fisher).Addendum: Methane Formation in Waterlogged Paddy Soils and its Controlling Factors (Y. Takai and E. Wada). 9. Potential Influence of Climate Change on Soil Organic Matter and Tropical Agroforestry. (E.H. Franz). 10. the Use of Models of Soil Pedogenic Processes in Understanding Changing Land Use and Climatic Conditions (J.W.B. Stewart, D.W. Anderson, E.T. Elliott and C.V. Cole) Addendum: Modeling Nitrous Oxide Production by Denitrification (J.R.M. Arah and K.A. Smith). 11. Impacts of Anthropogenic Atmospheric Pollution on Soils, with Special Relevance to Tropical and Subtropical Soils, and Possible Consequences of the Greenhouse Effect (N. Van Breemen). 12. Changes in Soil Resources in Response to a Gradually Rising Sea-Level (H. Brammer and R. Brinkman). 13. Soils on a Warmer Earth: Tropical and Subtropical Regions (W.G. Sombroek). 14. Soils on a Warmer Earth: Subtropical and Mediterranean Regions (D. Yaalon). 15. Impact of Climate Warming on Arid Region Soils (D.H. Dregne). 16. Soils of the Subboreal Region on a Warmer Earth (B.G. Rozanov and E.M. Samoilova). 17. Climate Induced Changes of the Boreal and Subpolar Soils (S.V. Goryachkin and V.O. Targulian). 18. Approaches to Mitigate Tropical Deforestation by Sustainable Soil Management Practices (P.A. Sanchez, C.A. Palm and T.J. Smyth). 19. Managing Global Change by Curtailing Emission Sources and Creating New Sinks (R. Grantham). 20. Implications of the Greenhouse Effect for African Agriculture (R.S. Odingo). 21. The Agricultural Environment of Latin America and The Caribbean and the Greenhouse Effect (N. Ahmad). 22. The Asian Agricultural Environment and the Greenhouse Effect (L. Venkataratnam). The theme of this book is a far reaching one and should attract great interest, both in industrialized as well as in less developed countries. 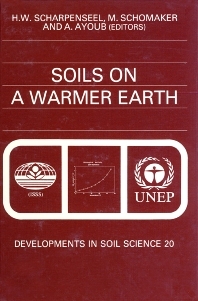 Although the question of climate change and its effects on soil productivity is overshadowed by so many current events, it is almost certain that this subject will remain on the international agenda for the years to come; not only as science and research are concerned but also in relation to development policies, agricultural policies and others, especially since poor, rich, developed and developing countries are equally threatened by these problems. University of Hamburg, Hamburg, F.R.G.